After a wicked touchdown at the holy Tomorrowland, Star Warz is excited to go back to its home base: the beautiful Vooruit in Ghent. They are teaming up with the inspiring Drum ‘n’ bass labels The North Quarter and Ish Chat Music. 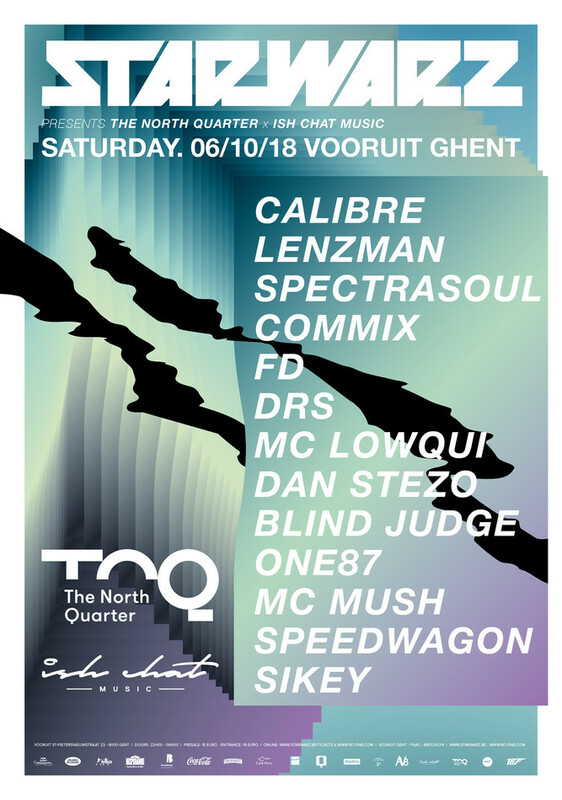 Metalheadz favourite and master of soulful drum & bass, Lenzman, launched his very own label, The North Quarter, in 2016. It was named after the area he grew up in. The imprint provides an outlet for those who "share a love and dedication for all things soulful." Sounds good to us! SpectraSoul founded their own label, Ish Chat Music, two years ago. The UK duo of Jack Stevens and David Kennett have been staples of the Shogun Audio roster for years, establishing their polished and melodic take on drum & bass (and beyond) over a steady stream of EPs and albums. With Ish Chat Music, named for a track from their first album, they're striking out on their own. "As artists, we have always written lots of different types of music," the duo say in a statement. "We wanted to create a vehicle to present some of those varied styles in a shorter format as opposed to an LP." Prepare yourself for a wicked night!